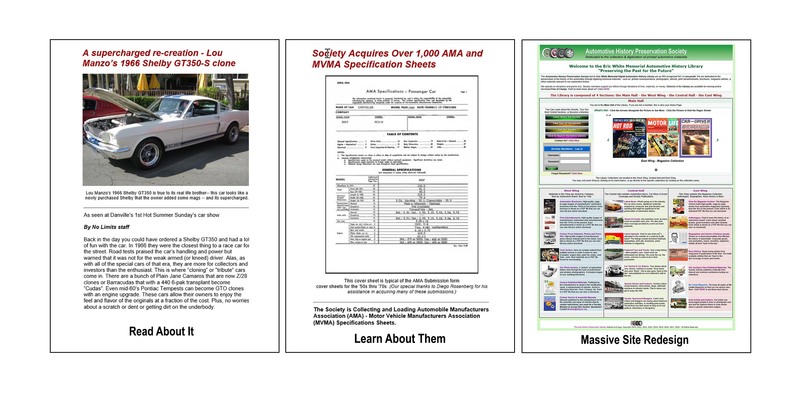 The Automotive History Preservation Society and its Eric White Memorial Digital Automotive History Library are an IRS recognized 501 c3 non-profit. 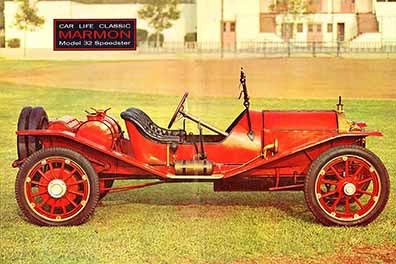 We are dedicated to the preservation of the history of the automobile through digitizing historical materials - such as: printed correspondence, photographs, artwork, print advertisements, brochures, magazine articles, & other materials relevant to our automotive history. We operate on donations and grants only. Society members support our efforts through donations of time, materials, or money. Materials in the Library are available for viewing and/or download Free of Charge. Want to learn more about us? Click HERE. You are in the Main Hall of the Library. If you are not a member, this is also your Home Page. Most Visited Sections, or Become a Member. The Library Collections are located in the West Wing, Central Hall and East Wing. You may visit each Wing by clicking on its name below, or go directly to the specific collections by clicking on the collection name. This Wing contains material either created by the manufacturers directly related to specific vehicles or brands or created by others about specific vehicles or brands. Automotive Brochures. 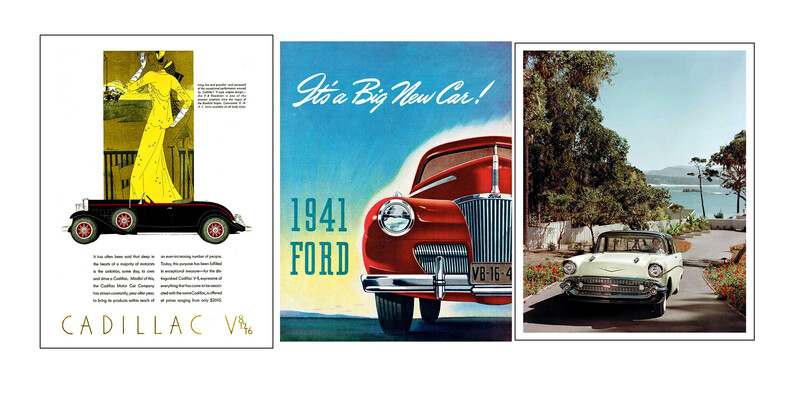 High-quality, page-by-page images of manufacturers' automotive brochures from the 1920's to the present. Each brochure is stored as a PDF file that you can view full size and/or download. Print Advertisements. High-quality images of manufacturers' automotive print advertisements from the 1910's to the present. Each advertisements is stored as a PDF file that you can view full size and/or download. Factory Press Releases, Photos and Press Kits. High-quality images of manufacturers' press release material sent to the media. Each item is stored as a PDF file that you can view full size and/or download. Tech Section. Here we compile material from multiple sources to make it easier to view. Examples: engine data, paint mix codes, road tests - and!. Most materials are in PDF file format for downloading. Our Photo Archive. A "picture" of automotive history seen through the eyes of professional and amateur photographers. It includes images of cars, buildings/structures. Factory Published Materials. Published by the manufacturers to assist in the modification, repair, & enhancement of vehicles. 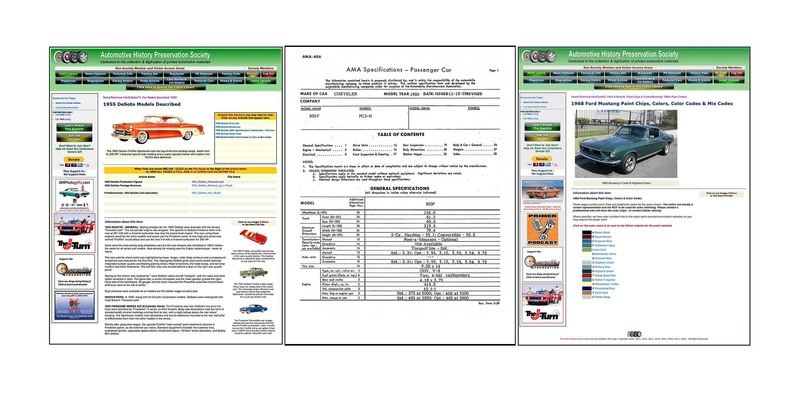 Bulletins, Marketing Materials, Parts Catalogs, etc. Each is a PDF file that you can view or download. The Central Hall contains Automotive News, Latest Uploads listings, Featured Cars and Trucks, Car Show & Event Coverage and non-Society bloggers. Latest News. What's going on in the industry, the car show scene, significant materials acquired by museums and auto libraries and anything that might be significant to the preservation of automotive history. Shows & Events. Our reporters cover as meny event as possible each year. We also post show coverage provided by event out reach publicists. Latest Uploads. Want to see what we've uploaded to the website on a week-by-week basis? The lisitngs contain technical materials, biographies, print ads, brochures, press releases & magazines. Featured Cars and Trucks. See Living History - other people's cars. Catch what car enthusiasts are driving. We cover the car, the owner, and how it came to be in their possession. Car Stories & Car History. True stories about cars, drivers, activites & events. All by those who were "there". We've also gone "back in the day" and published our own material to add to the mix. Special Stories and Features. Society writers create features, short stories, blogs, editorials, reactions to industry trends. This is where you get to enjoy the ride! Society Sponsored Bloggers. Catch what writers and bloggers are saying about historical automotive activities, or recalling past events. We let them say their piece as long as it's not political, inflamatory or derogatory. Anthologies, Biographies, Race History, Bios of Noted Automotive Artists & Authors, and More. View the Magazine Archive. 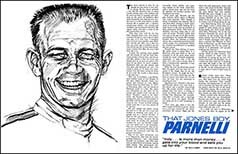 The Magazine Archive holds high-quality, page-by-page stories from automotive magazines spanning from the 40's to the present. Each article is an individual PDF file that you can download. Anthologies. Want to learn the history of an automotive brand? Learn about vanished brands, great inventions and other factoids. Each article is stored as a PDF file that you can view /or downloadt. Biographies and stories of famous people. Stories on & about personalities that affected the history of automobile. Corporate greats, race promoters, racers, inventors, engineers, stylists all from "back in the day". Race History. Read racing articles from magazines & publications of the time. We make available articles that are "back in the day"coverage of races and events.. The Society's Own Published Materials. The Society actively publishes materials from internal and external contributors touting our collections. No Limits Magazine. We keep all copies of No Limits Magazine so that you can always view them. Click HERE to see these back issues. Auto Artists and Authors. Our hobby has encouraged people to draw or photograph cars and and his inspired others to write stories about a specific automotive subject..